Heat a large nonstick skillet over medium-high heat. Add half of the EVOO and brown the chicken breasts or thighs for 3-4 minutes on each side. Remove the chicken from the pan and season with salt and pepper. Return the pan to the stove, reduce the heat to medium and add the remaining EVOO. Add the crushed pepper, sliced mushrooms and garlic. Season with salt (salt is a magnet for drawing out liquid). Cover and cook the mushrooms for 5 minutes, or until the mushrooms are dark, tender and have given off their juices. Add about 1/2 cup of beef broth to intensify the wild mushroom flavor, then stir in the tomatoes and parsley. Cut the chicken into bite-size chunks or slices and it add to the sauce. Simmer the sauce for 5 minutes to finish cooking the chicken pieces and to allow the flavors to combine. Toss the pasta with the cacciatore and serve with crusty bread and grated cheese. Cook’s Notes: Beef broth and stock is now available in resealable paper boxes, which can be found on the soup aisle of your market. These paper containers make storage of the remaining broth easier; keep some on hand in your refrigerator. Beef broth is used instead of chicken broth in this recipe because it pairs better with the beefy taste of portobello mushrooms. The broth will make your cacciatore taste as if it simmered all day because it accents the mushroom taste well. Depending on your brand, 1 large can of tomatoes can vary in weight from 28 to 32 ounces. Use your favorite, but check to make sure the product is sugar-free. In Recipes-list.com we have selected the most viewed recipes from category - uncategorized . Enjoy the best recipes specially selected for you! 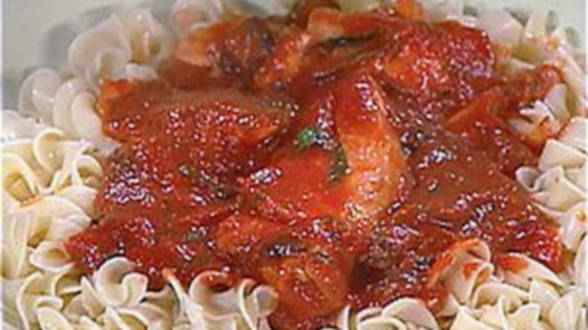 Quick Chicken Cacciatore is the right choice that will satisfy all your claims.